Big Opera—up close and personal. The secret to successful opera may well be accessibility. In this, West Bay Opera leads the pack in its close and personal performances. This was certainly the case last Friday, Oct. 14 at Palo Alto’s intimate Lucie Stern Theater, where they mounted a grand production of Samson et Dalila by Camille Saint-Saëns. Based on the Biblical story of the Hebrew Hulk, Saint-Saëns’ opera features music that bridges late French Romanticism and early Impressionism, with complex choral writing and one of the best-known arias for the mezzo voice, “Mon cœur s’ouvre à ta voix” (My heart opens to your voice). 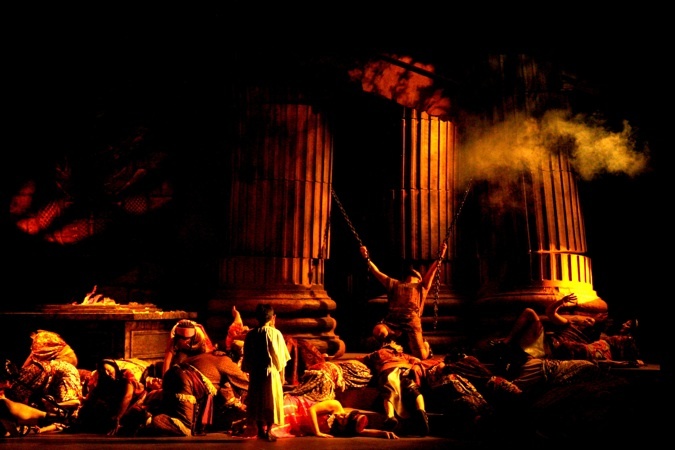 In Saint-Saëns’ hands the story is more French Opera than moral tale, cast as a tapestry of passion and revenge against a ground of high priests and temptresses. The Biblical verses, rather, emphasize one’s tribal obligations, subsuming the individual in community. In the Bible, Samson’s wild actions, ungoverned lust, and hubris endanger the community and invite counter-attacks. This is a far cry from Delilah as vengeful plotter, but hey! That’s opera. Saint-Saëns used an unusual combination of voices: rather than the usual baritone v. soprano, the leads are Samson’s tenor and Delilah’s low mezzo, nicely bracketed by the bass voices of the Philistine High Priest and Hebrew patriarch. 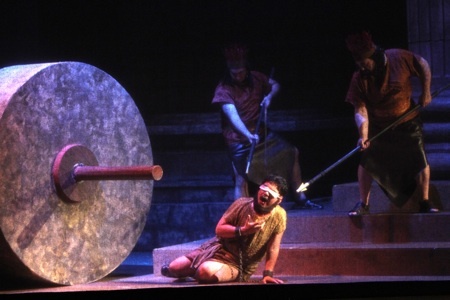 Not any tenor could do justice to the role of Samson. His part is long on difficult music and short on flashy arias. Percy Martinez brought a throaty power with a tinge of bass timbre, a glorious fit for Cybele Gouverneur’s smoky Delilah. And that Delilah! Her “Mon cœur…” was inspired, with high notes that teased into such softness that many held their breath. Her pauses were gilded with descending flute runs and the violin “tsi-tsi-tsi-tsi” of night crickets. Bass Carlos Aguilar, a regular with the San Jose Opera, was a splendid Old Hebrew patriarch, rumbling admonitions with moral certitude (and warning Samson of woman trouble). Though the opera includes its own moral slights–Delilah spends a lot of time waiting around to practice her wiles–its music remains timeless. Deep chromaticism and scales inspired by travels to North Africa were balanced by Saint-Saëns’ love of French classical traditions. Each overture had its own themes, repeated rising or descending scales that mirrored Debussy’s experiments. Where the orchestra was complex with modal or octatonic forms, and bright hued with flute and harp, the Hebrews showed their simple faith with village pentatonic and unison vocal lines. Teasing apart the themes, Saint-Saëns staggered entrances to create a sense of fragility. The sets, designed by Jean-Francois Revon, were splendid, with massive sandstone pillars surrounded by slaves wearing tattered earth tones. Adding weight and menace, the squat steles were bright lit by a merciless Mediterranean sun. Chained slaves rolled a grindstone in a slow arc, a stone that made palpable the crushing weight of slavery. And the final scene Bacchanal? We were given a long moment to appreciate the frozen tableaux before the translucent scrim rose. Then, Kunst-Stoff dance company supplied three excellent dancers to complete the decadence, with Yannis Adoniou’s sinuous choreography. But the Philistine costumes at first appeared to lack verisimilitude. I was surprised to see the warriors prance out in what appeared to be crowns of chicken feathers, and was reminded of my first grade efforts for Thanksgiving. Wondering how they really looked, I searched historical Philistine sites online and was rewarded with a careful pen and ink rendering of a warrior… draped in wall hangings and crowned with chicken feathers! How did I miss this? And a corollary: when is it okay to not be faithfully historical? West Bay Opera has two more performances this weekend, Saturday, Oct 22 at 8:00 and Sunday Oct. 23 at 2:00, both at the Lucie Stern Theatre, 1305 Middlefield Rd, in Palo Alto (near Embarcadero Road). Tickets and information available at www.wbopera.org or by phone at 650-424-9999. Photo top of Percy Martínez as Samson and Cybele Gouverneur as Dalila: photo bottom, Samson brings down the temple on the Philistines—all photos by Otak Jump.